The Award of Christmas Blitz-Tourney JF-2012! 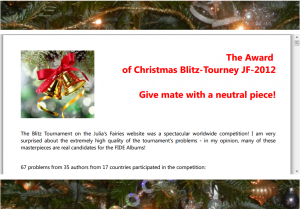 I’m very-very happy to present you a preliminary Award of The Christmas Blitz-Tourney JF-2012! It was prepared in a very short term, and I’m sorry if there’re any mistakes! A term of 10 days is given for possible remarks or objections, and after this term the results will be announced as final results. Congratulations to the Prize Winners!! Thanks a lot to all of you, my dear participants! 4 Responses to The Award of Christmas Blitz-Tourney JF-2012! Congrats Julia on winning another top prize with a wonderful problem. Thanks! But this is really Michel’s Prize! In this problem Michel has used the idea of mine, recently published in feenschach – I’ve just added it to my problems: http://juliasfairies.com/my-problems/problem-no-27/ – but he has expanded it so much, and has added so much beauty, that I feel my name can be written with a very small letters there (if should be mentioned at all!). Of course, I’m happy to have such joint problem! And most of all I’m happy about the results of this tourney, that it is successful, that we’ve done it and finished in time as I wanted and had promised.. Thanks to all of you one more time! And let’s start a New Year with a new successes!!! Very high level tourney with many masterpieces! Congratulations to the winners! Yes. Many outstanding problems likely to be quoted widely. Such high quality problems in a Blitz Tourney is unexpected and pleasant.